July 4th is all about America and when it comes to food America is all about barbeque. And these pork ribs can be prepared up to two days ahead of time so even after some exuberant celebrating, with a little bit of planning, they’re guaranteed to come out tender and tasty. After years of experimentation I’ve found the easiest way to ensure tender barbequed pork ribs every time is to bake them for two hours before finishing them off on the grill. Preheat your oven to 350, combine your favorite combination of sugar, salt, and spices, rub both sides of your racks generously, then bake in a covered roasting pan for two hours. 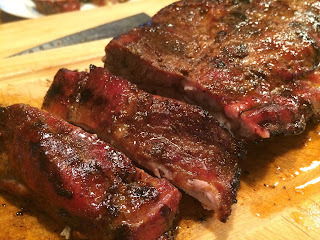 And whether you’re grilling immediately or in a couple of days simply baste the ribs with barbeque sauce for 10 to 15 minutes while turning frequently over high heat.